The company saw 25% of its value wiped out in a morning. A customer enters a shuttering Sears store in downtown Vancouver, B.C., Sept. 13, 2012. TORONTO — Sears Canada's stock has plunged this morning following a news report that it's preparing to seek bankruptcy protection within weeks. The shares fell 25 per cent to 60 cents on the Toronto Stock Exchange shortly after the open Wednesday. The stock had already declined from $1.14 on June 12, prior to a company warning that there was "significant doubt'' about its future and that it could be sold or restructured. Sears Canada didn't immediately comment on the article by Bloomberg that says the national retailer is preparing for a court filing or liquidation. The Toronto-based company and its American counterpart have been suffering from dwindling sales for years from changes to consumer buying patterns and new competition, particularly from online shopping. In April, Sears Canada announced that its 2016-17 loss was $321 million. 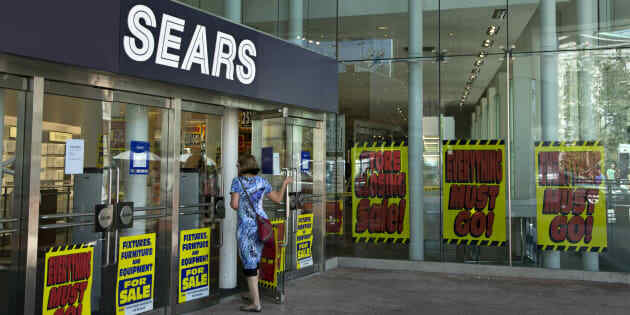 Shareholders rank after lenders and creditors in a court-supervised bankruptcy proceeding, so Sears Canada shares could become worthless if it files under the Companies Creditors Arrangement Act or Bankruptcy and Insolvency Act. According to regulatory documents, its biggest direct and indirect shareholder is Edward S. Lampert, who also controls the Sears Holding Corp. — a public company that owns Sears and Kmart stores in the United States. Shares of Sears Holdings, which retains a minority stake in the Canadian operation, are down six per cent this morning on Nasdaq.